As the weather heats up the insects are literally crawling out of the woodwork. Oh, how I hate the bugs. Don't get me wrong, I know that bugs have a purpose in this world and I applaud that. What I take issue with is bugs infiltrating my personal space. Do you feel the same? If you do, you'll appreciate these tips for getting rid of those pesky pests without the use of harmful insecticides. I do not like ants. Period. I tolerate them outside, but I do not like them. If they dare enter my home it is war! Yes, You Can Get Rid of Ants! A little Borax, some sugar, some water and lots of patience will rid you of these bothersome invaders. Spring and summer are the seasons for all kinds of wonderful fruits. If you are like me you return from your grocery shopping trips with beautiful, ripe fruit that you proudly display in your countertop fruit bowl. A day or two later you'll begin to see those very pesky fruit flies zipping around your kitchen. Not to worry. A little apple cider vinegar and dish liquid will bring an end to those annoying pests. Summer and barbecues. Ahh, what a wonderful time of year. 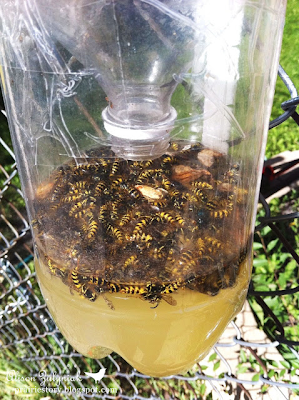 Yes, barbecues and picnics are wonderful, until the yellow jackets start buzzing your party. Children and grown adults, alike, run screaming at the sight of those pests. Not to worry, you can build a trap that will keep the yellow jackets at bay. Try these simple techniques to keep insects at bay in your personal space. You'll be happy you did. Thanks Donna. We have carpenter ants, not much we can do but spray and hubby puts cinnamon and borax on the roof. They walk along our bathroom ceiling and then go away. Since I am allergic to buzzy things, will try the yellow jacket trap! I am so happy to have found out how effective borax is on bugs! I don't mind the little creepies outside, but they have no place in my house! Hi, I found you on Pinterest and I'm glad I did. I'm trying the ant idea right away. Thanks for stopping by, Cindy. I hope you'll let me know how it works for you. Good luck!